The greatest accomplishments in politics are not always noticed or remembered. Often we take worthy actions for granted if they are done behind the scenes by men who wish not to call undue attention to themselves. Such men presided smoothly over good times and made it look easy. President Eisenhower is a good example of strong, classy, conservative leader who did right by his country and his people without making a big fuss about it. And then you have North Carolina Senator Jesse Helms. Helms was all about fuss, all right. At any given moment, either he was making it or his opponents were, which was usually after he beat them in an election. And throughout his 30-year career as the most conservative and most hated member of the US Senate, Jesse Helms never lost an election. We all know of how William F. Buckley purged the conservative movement of the John Birch Society in the early 1960s, thereby evicting race-realism from the conservative half of American politics for over 50 years. Well, Jesse Helms never got the memo. For years, as America kept blundering leftward in its mainstream culture, Helms often seemed to be the one doing the most to hold it back. If the culture war in the latter half of the 20th century were a tug-of-war, Jesse Helms was the man at the very end of the line with the Popeye forearms and tugboat thighs and the rope tied around his waist and his heels digging into the sand. There was no compromise in Ol’ Jesse, or “Senator No” as he was known by friend and foe alike. There was a lot of liberal legislation that never got off the ground because of him. And for this, the Alt Right today owes him a tremendous amount of gratitude. I’m guessing that future Senator Helms was expecting the answer to these queries to be an emphatic, “No.” Not exactly the high road, was it? But it worked, and young Helms was soon employed as an administrative assistant to Senator Willis Smith in Washington. 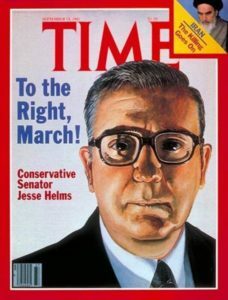 For nearly the rest of his career, as a journalist, television commentator and senator, Jesse Helms stood in the way of racial “progress.” Sure, he was more upfront about it early on, but he never once wavered from his race-realism and his understanding that the forced equality and cohabitation of black and white can only lead to trouble. He was highly critical of the Civil Rights Movement. He never tired of labeling Martin Luther King, Jr. a communist and a degenerate. He staunchly opposed forced integration of schools through busing. He pushed unsuccessfully to unseal Martin Luther King’s FBI records. He filibustered against extending the Voting Rights Act. He filibustered against making Martin Luther King Day a national holiday. He supported Apartheid South Africa. He also hated affirmative action and actively campaigned against it in his later career. Unlike other former segregationists such as George Wallace and Strom Thurmond, Jesse Helms never once pandered to blacks or courted them for votes. No one could say he wasn’t a model of consistency. Hailing from rural Monroe, North Carolina, Jesse Helms was born in 1921 to a lower middle class, churchgoing, Scotch-Irish family. His father, “Mr. Jesse,” served as both the town’s chief of police and fire chief. Young Jesse was the reserved type, smart, churchgoing, and musical. As a high schooler, he won a statewide sousaphone competition. As a college student and aspiring journalist, Helms swept floors and washed dishes to survive. He served stateside as a recruiter for the US Navy during World War II. Later on, he developed an interest in libertarian economics which rivaled his devotion to the Christian bible. After his brief stay in Washington with Willis Smith (who died in 1953), Helms returned to North Carolina where he made a career as a columnist and a radio and television commentator. His writing was filled with folksy charm and predictably did not stray from his conservative principles. His television work throughout the 1950s and 1960s however made him famous in North Carolina. His acerbic wit bordered on cruel but was never boring. He attacked left-wing professors, hippies, homosexuals, fornicators, anti-war protesters, union bosses, communists, and many more. He knew this made him seem out of fashion, but didn’t care. Why should he? He had the Bible and the Constitution and the majority of North Carolina on his side. In a sense, he had a point. He certainly didn’t like liberal blacks, such as the time when he shared an elevator with black Senator Carol Moseley-Braun and purportedly sang “Dixie” in order to make her cry. But Jesse Helms didn’t like liberals in general, regardless of race. There is little on the record of Helms abusing a conservative or otherwise respectful black. In fact, when black civil rights icon James Meredith was looking for a job in government in the late 1980s, Helms took him on. When asked why he accepted a job with the notorious Senator Helms, Meredith responded that Helms was the only person in the Senate who responded to his letters. I can’t prove this, but I suspect that Helms had no animus at all towards blacks and actually felt he was acting on their behalf whenever he opposed racial integration and other civil rights measures. Helms was at heart an old-school segregationist, not a white supremacist. He felt that the races could coexist provided that the law enforced that natural order of things, which included the manifest differences between black and white. And for Helms, anything that took people away from the natural order of things was evil. I’m sure he felt he was doing his black constituents a favor by standing up for the natural order. Statistics on crime, illegitimacy, drug abuse, unemployment, and educational achievement among blacks today prove that the Civil Rights Movement had been a failure and that Helms had indeed been correct. So then, who really is the racist here? The people who pushed blacks into the ill-advised integration experiment, or the man who wanted to keep them segregated where they would do the most good and the least amount of harm? Another reason the racism charge never really stuck was that Helms was a genuinely courteous and old-fashioned Southern gentleman. He also knew how and when to pour on the charm. Once in the 1990s, when he was the Chairman of the Senate Committee on Foreign Relations, he addressed foreign dignitaries by promising to teach them how to speak Southern English. He began with phrases such as “Bless yo’ heart!” and “I doo declare!” He got a lot of laughs for that. Once elected to the Senate, Helms quickly proved to be one of its most consequential members, even if many of his initiatives ended in failure. He was the first to tell anyone that he was loyal to principles before people, which is why he locked horns with moderate Republicans almost as much as with liberal Democrats. He preferred losing on principle than winning by compromise. Like Southern leaders during the Civil War, it was all about honor with Helms. And he never got discouraged after a defeat. He has an innate craftiness and cleverness that’s stunning to watch. You can’t box him in—he’ll defang you when you get close. Anyone who sells him short is going to lose—and has. He’s amazing and formidable. Helms also picked the right friends. He was always a big fan of Ronald Reagan, and when Reagan’s bid to unseat President Ford during the 1976 Republican Primary began to fizzle, it was Helms who came to the rescue. Helms encouraged Reagan to stay in the race, raised money for him, and blitzed the Tar Heel state with enough pro-Reagan television ads to swing the state in the Gipper’s favor. After that, Reagan became a real threat for Ford and nearly snatched the nomination. From then on, Ronald Reagan was a star in the Republican Party. Many insiders believe that he never would have emerged victorious in 1980 without the help and encouragement of Jesse Helms. Helms also had a thing for Latin America. He operated what amounted to a secret state department there in order to stave off the spread of communism. He had operatives everywhere, and was better informed than most senators about what was going on. In his Cold War travails, Jesse Helms always kept his eye on the bigger picture, and understood rightly that, while both were bad, petty right wing dictators were much less of a threat than petty left wing ones were. Thus, he put his full support behind Latin American right wingers such as the Contras in Nicaragua and Augusto Pinochet in Chile. This often led to some ugly exchanges whenever these right wingers did reprehensible things. Assuming that they actually said this and assuming that Helms had given his blessing for this kind of talk (and, knowing Helms, he probably did), this actually should endear Helms to the Alt Right today. Unlike liberals, he understood that the Cold War was a war, and that in war there are casualties. No entity in history killed and oppressed more white people than the Soviet Union . . . from the bloody Russian civil war, to the terror-famine in Ukraine, to the ethnic cleansing in the Caucasus, to the suppression of dissidents in Russia, to the invasions and control of Eastern Europe. The list goes on and on. What were liberals like these Witness for Peace people doing when the Soviets were killing doctors and nurses and children in those places? We know what Helms was doing during his time in the Senate, on the other hand. He was doing the hard work of resisting the Soviet Union at every turn. And if that meant working with some less-than-ethical individuals in Nicaragua, so be it. Helms also had a way with words which no doubt sprung from his years as a writer and editor. He was a veritable font of put-downs and insightful witticisms. My favorite is when he likened President Jimmy Carter to a Cheshire cat. “. . . whenever you try to get a straight answer out of him or pin him down to something factual, everything disappears but the grin.” Jesse Helms had a unique ability to embarrass friends and enemies alike, which no doubt lent much to his formidable power and influence. Another inspiring aspect of Helms’ legacy was his discipline and competence. He really did work for his constituents, and everyone in North Carolina knew it. I once met a person from North Carolina who told me as much. He was a musician from Chapel Hill, a liberal stronghold in the state. He told me he hated Helms but gave the man credit for his unswerving alacrity. The musician relayed a story about how his sister needed her passport approved during the federal government shutdown in the mid-1990s. Her situation was close to desperate and she contacted both her senators for help. She never heard back from the other senator, but she heard back from Helms who took care of her problem that very day. As a service senator, Jesse Helms was second to none. So, looking back at Helms, what can the Alt Right take from him? Well, front and center is his race realism. He might have been a bit cagey admitting it after a certain point, but he never wavered from it and never apologized for it. The man was as stalwart on race as you can get. In hindsight it seems almost a miracle that he survived in government at all, let alone thrived in it for 30 years. But he went beyond mere race realism. Jesse Helms also identified as white and made it acceptable for his constituents to do the same. When running against Nick Galifianakis in 1972 (an uncle of comedian Zach Galifianakis), he put up billboards which read “Vote for Jesse; He’s One of Us.” Galifianakis was the son of Greek immigrants and apparently wasn’t white enough for North Carolina in 1972. Helms beat him handily. A more memorable example of Helms’ appeal to white identity appears in a brilliant TV spot he aired during his campaign against Harvey Gantt in 1990. Gantt was the black mayor of Charlotte and was expected to give Helms a stiff challenge for his senate seat. But Gantt, like most Democrats, supported affirmative action, and Helms dinged him for it with his famous “Hands” ad. “Hands” portrayed a pair of white hands crumpling a rejection letter with a morose narrator lamenting that “you” lost that job to a “less qualified minority.” This ad caused such apoplexy among liberals because that “you” referred exclusively to white people. This was an ad made by white people for white people who were acting in white interests in the majority-white North Carolina. If you weren’t white and you didn’t like it, Jesse Helms says too bad. Another thing the Alt Right can take from the legacy of Jesse Helms is his use of technology. For a man who was so old-fashioned, he sure rode the multimedia cutting edge back in the day. I know we on the Alt Right think we’re awful clever with our memes and parodies and YouTube videos (and make no mistake, we are), but what Jesse Helms accomplished with radio, television, and direct mail campaigns 40 years ago is downright astonishing. He didn’t invent the television ad, but he was one of the first to take the shotgun approach to them. In his hotly contested race against Jim Hunt in 1984, he ran nearly 150 attack spots. Most of these were low-budget, 10-to-15 second clips attacking his opponent on a number of issues. Many featured Helms himself speaking directly into the camera. Now, Helms wasn’t exactly a good-looking man (he started his career in the senate at age 51), but his unshakable confidence in his principles (bolstered, no doubt, by his patriotism and his faith in God) gave him a charisma which I can only describe as fearsome. That he never lost an election shows how effectively these ads made people realize this as well. If the Alt Right can find a sticking point with Helms it would be with either his nigh-militant Christianity or his inflexible homophobia. The Alt Right today tends to think that white demographic displacement is a much bigger issue. Perhaps the most important thing we can take from Helms, aside from his race-realism, is that the man was a fighter. Politics for him was nothing less than a proxy for war. Nobody waged scorched earth political campaigns better than Jesse Helms. Nobody fought harder and nobody went lower. When the historians of the future talk about the meanest, the most acrimonious, the outright nastiest political campaigns in American history, first place will probably go to Donald Trump versus Hillary Clinton in 2016 due to its vast exposure and impact. But second place, by a razor-thin margin, will have to go to Jesse Helms versus Jim Hunt in 1984. Nothing was off the table in that donnybrook. Helms played the race card by associating Hunt with black huckster Jesse Jackson. He accused Hunt of wanting to harm America financially by supporting the Martin Luther King holiday. His campaign indirectly called Hunt a homosexual in a Chapel Hill newspaper. He also went after Hunt for his lack of a war record. Hunt began his campaign in a more conventional fashion with mostly positive ads about himself. Once his lead in the polls began to slip, however, he realized he was in a dogfight and went straight for the jugular. He attacked Helms everywhere he could, with social security, school prayer, and taxes being the most prominent issues. Hunt also aired a grisly ad which linked Helms directly to Right-wing death squads in Central America, effectively accusing his opponent of murder. Still, it wasn’t enough. Many white North Carolinians are no doubt motivated to vote for Helms because of the almost primal fears he fans. “The principles we’re espousing have been around for thousands of years,” former aide James Lucier once explained, citing the “prepolitical” themes of God, family, property, and national pride. That in a nutshell is the Alt Right. We may be new on the scene, but that which binds us — our race, our gods, our culture, our history — is older than the countries in which we live. When Jesse Helms was coming up, as he puts it, his race was his nation. America was still a nation-state of white men. Today, with non-white immigrants looking to subjugate us and displace us over time, our nation — our racial diaspora — will soon be under as much threat as Jesse Helms’ was during the Cold War. In looking back at this great man, I can only hope that when the times comes, we will take inspiration from Jesse Helms and fight as hard as he did, hitting them early and often. William D. Snider, Helms and Hunt: The North Carolina Senate Race, 1984 (University of North Carolina Press, 1985). David Mark, Going Dirty: The Art of Negative Campaigning (Rowman and Littlefield Publishers, 2006), chapter 6. Published: November 29, 2016 | This entry was posted in North American New Right and tagged articles, conservatism, Jesse Helms, North American New Right, originals, Republicans, Spencer Quinn, white political activism. Both comments and trackbacks are currently closed. I was quite young when Helms was in office, and politics was far off my radar. Yet even with the minescule amount of attention I was paying, I was struck how relentlessly demonized Helms was by the MSM. You would have thought he was running a satanic pedo pizza parlor. Their treatment of Trump struck a similar tone for those to young to have experienced it. I will say this about the left – they know how to fight. No tactic is off limits, too extreme, or too dirty. Winning is the only thing that matters. The left calls the AltRight “extremists”. I could quibble with that epithet being applied so broadly, but it’s irrelevant. The left’s “by any means necessary” ethos has left those opposing them no other option than to fight back twice as hard. Thanks for the reminder of others in the past who’s principles also demanded they choose the more challenging path. I always look forward to your pieces Spencer. PS – did you notice that Ace (AoS) has fully embraced a “fight fire with fire” approach to beating back the left? It only took two years, and several ugly fights with his cucked co-bloggers. I have a question. I seem to remember that Helms once donned a yarmulke. I can’t remember if I saw the photograph or if I read about it in “The Israeli Lobby” by Walt and Mersheimer (although I think it was the latter). My question is that if this is true, did Helms do this because 1) he was a sincere Christian Zionist or 2) he felt he needed to do it in order to get the support of the Jewish lobby? Thank you, Judd. Not sure what prompted Helms’ turnaround with Israel. Maybe he saw them as allies against the Soviets? The more likely scenario, however, is that he was scared straight after the Israel lobby gave a tremendous amount of money to Jim Hunt to unseat him in 1984. Helms beat Hunt by a tiny tiny margin. Perhaps he didn’t want his next opponent to be so well funded. IMO, Helms is relevant to the Alt Right today mostly for his stance on black-white race relations, his white identity politics, his contempt for political correctness, and his innovative and pugnacious approach to politics. I’m sure in hindsight we can appreciate his anti-Soviet stance as well. There is little else beyond that, but still, that’s quite a bit, which is why I think he should be remembered fondly. Wonder how eager Helms would have been to work with dead-eyed pussies like Paul Ryan and his ilk. It seems almost unbelievable now that somebody like Helms could be elected to anything! No need to wonder. He would have put Ryan over his knee so many times that Ryan would have no choice but to shift right. For all of Helms’ flaws, we could really use him in the Senate today. No. What happened was that Senator Moseley-Braun stepped into the elevator saw Senator Helms and then raised her fist and shouted “Black Power” at him! And THEN Senator Helms started whistling in Dixie in response. In 1984, however, Senator Helms made the most astonishing turnaround in American politics. The occasion was the closest election in Jesse Helms’ already long career. Prior to his run for re-election Jesse Helms had been described by the Israel lobby as the most dangerous opponent of Israel in the United States. In fact, his record on Israel was the most negative of any member of the Senate, he had the lowest rating of the American Israel Public Affairs Committee (AIPAC) of any senator.